Perhaps it all started with a turn in China’s demographics. 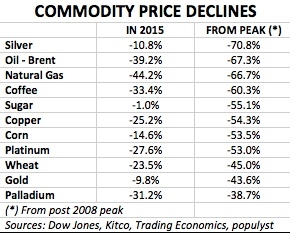 Demand growth for commodities has declined sharply from recent years and has resulted in a crash of global prices. Copper is down 54% from its post 2008 peak and down 25% this year alone. Crude oil is down 67% and 39% in the same time spans. In addition to softer demand, prices were negatively impacted by jumps in supply, most notably from shale energy producers in the United States. If this massive price correction tells us anything, it is that the world is looking more vertical again. Aspiring economic powers of two or five years ago are grappling with the recessionary effects of lower prices for oil, natural gas, copper, iron ore and nearly every other commodity. If, per Warren Buffett’s impeccable quip, “you don’t know who is swimming naked until the tide goes out”, the commodities tide has gone out of the emerging markets boom and many were haplessly exposed in the raw. Swimming naked in this context means an economy that was overly dependent on one or two drivers of growth. In the case of Russia, it was too dependent on energy. Brazil, too dependent on copper, iron ore and other commodities. And in both cases, not enough effort was made to diversify the economy and to implement needed reforms during the good times. The curse of cyclical wealth is that in good times, there seems to be no compelling reason for reforms. Why tinker with something that appears to be working? And in bad times, it is more difficult to implement those same reforms. Why create even more uncertainty in a time of uncertainty? Leo Abruzzese of the Economist Intelligence Unit writes that “in 2016 rich countries will account for their largest share of global growth in this decade.” The EIU estimates that the eight largest rich economies will contribute 43% of global growth, while the eight largest emerging markets contribute 34%. These are respectively the highest and lowest shares in several years and they represent a big reversal from 2013 when the rich eight contributed 31% of global growth and the emerging eight as much as 47%. See chart in this article. Among the flag bearers of emerging markets, Russia has suffered a crisis and a recession caused by the decline of energy prices and some foreign sanctions imposed during the Ukraine conflict. As shown in the table, Russia’s compound average real GDP growth has slowed from 6.1% in 2001-05, to 3.5% in 2006-10 and to 1.4% in 2011-15. The more recent two five-year periods both include a crash in the price of oil from over $100 to less than $40. The economy is expected to contract 2.7% this year. Russia’s problems are partly due to demographics because its population is shrinking and its dependency ratio is rising. But other reasons for the slowdown include a dearth of innovation and a business climate which discourages inward investment. China’s impressive real GDP growth printed at or near double digit annual rates for the entire decade 2002-11 but this growth has tapered starting in 2012 to an estimated 7.1% in 2015 and probably lower next year. As discussed here, China managed to capture a very large demographic dividend thanks to sound policymaking that encouraged trade and investment. But its dependency ratio has now bottomed and started to climb. In response, China can avoid a prolonged decline by adopting reforms that encourage innovation and investment. Brazil is in the midst of a contraction made worse by corruption scandals at leading companies such as Petrobras and BTG Pactual. The demographic picture is mixed but there will be little to cheer about before reforms are enacted to reduce corruption and encourage investment. The alternative is to wait for the next commodity bull market but this could take years to materialize. India looks best among the BRIC countries in part due to its more favorable demographics and to the promise of accelerated reforms under prime minister Modi. We discussed India’s demographics and the prospects for investments and legislative reforms in previous posts here and here. Outside of the BRIC countries, countries with favorable demographics could over time pick up the torch and lead a revival of emerging markets. These include Pakistan, Indonesia, the Philippines, Nigeria and other countries of sub-Saharan Africa. Because of its booming working-age population, Africa holds the most promise but also presents the biggest challenge. See previous posts on Africa discussing policymaking, education, demographics, trade and infrastructure. It is an accident of history that for the last several centuries, the richest countries in the world have all been very small in terms of population. Denmark has 5.5 million people, the Netherlands has 16.6 million. The United States is the biggest of the bunch and has dominated the advanced industrial world. But the real giants—China, India, Brazil—have been sleeping, unable or unwilling to join the world of functioning economies. Now they are on the move and naturally, given their size, they will have a large footprint on the map of the future. When we look back beyond a hundred years over the long trails of history, we see immediately why the age we live in differs from all other ages in human annals. Mankind has sometimes travelled forwards and sometimes backwards, or has stood still even for hundreds of years. It remained stationary in India and in China for thousands of years. What is it that has produced this new prodigious speed of man? Science is the cause. Her once feeble vanguards, often trampled down, often perishing in isolation, have now become a vast organized united class-conscious army marching forward upon all the fronts towards objectives none may measure or define. It is a proud, ambitious army which cares nothing for all the laws that men have made; nothing for their most timehonoured customs, or most dearly cherished beliefs, or deepest instincts. It is this power called Science which has laid hold of us, conscripted us into its regiments and batteries, set us to work upon its highways and in its arsenals; rewarded us for our services, healed us when we were wounded, trained us when we were young, pensioned us when we were worn out. None of the generations of men before the last two or three were ever gripped for good or ill and handled like this. Zakaria emphasized demographics while Churchill focused on the importance of science and innovation. Both are key components of growth. Some European countries such as Denmark and the Netherlands may not weigh much demographically but their contributions to the advancement of science and philosophy easily exceed those emanating from many populous nations. As often discussed on this page, demographics are an important driver of the economy, but they are only one of several important drivers, the others being innovation, productivity, health, governance and institutional strength. Demography is not destiny but it is a part of destiny. It cannot alone deliver sustainable economic growth and it can at times impact the economy adversely. In the present case, a turn in demographics is one of the reasons for China’s slowdown and the resulting fall in commodity prices. It is true that China, India and to a lesser extent Brazil are demographic giants. But it does not follow that their economic progress was unnaturally held back for centuries, while diminutive populations raced ahead due to a temporary fluke of history. Those smaller populations had innovation and a conducive context going for them. In order to be sustainable beyond one economic cycle, or even one economic super cycle, strong growth requires innovation, reliable institutions, good governance, political plurality and low corruption. It is still early in the century, but for now, the rise of the rest seems to have stalled. The questions going forward are: is this merely a pause in the development of poorer nations or is it the beginning of an unfortunate reversal? What can be done to build upon the past boom and to put these nations and others back on the growth trajectory?